That’s called forced accountability or when an unrepentant company pathologically continues to engage in unethical and or illegal behavior until forced accountable; and, is more common between the feds and major corporations than people think. Remember when a company releases a statement that “they decided” to pull a product that’s really just code for behind closed doors the feds threatened the company to pull the product or they’d be forced to investigate. We see this often in pharma and med device. Fortune Magazine released the Fortune 500 of the top companies worldwide. This year’s Fortune 500 marks the 61st running of the list. In total, the Fortune 500 companies account for $12.5 trillion in revenues, $945 billion in profits, $17 trillion in market value and employ 26.8 million people worldwide. Quite a few companies on the list have been written about on this site for pathologically employing unethical and or illegal tactics from The Sociopathic Business Model™ where that behavior has been encouraged, replicated and rewarded at all too high of a cost to patients, consumers, employees and taxpayers alike. 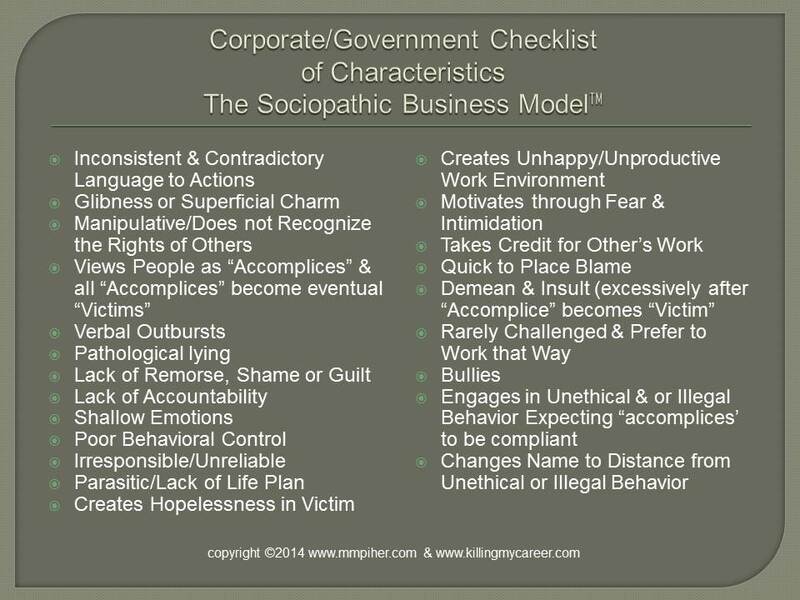 The DOJ really should use this list as guide to catching corporate criminals. Mary Barra GM CEO killed 87 people with the company’s ignition switch problem while the company ranked 7 last year jumped a spot to 6 this year on the Fortune 500. 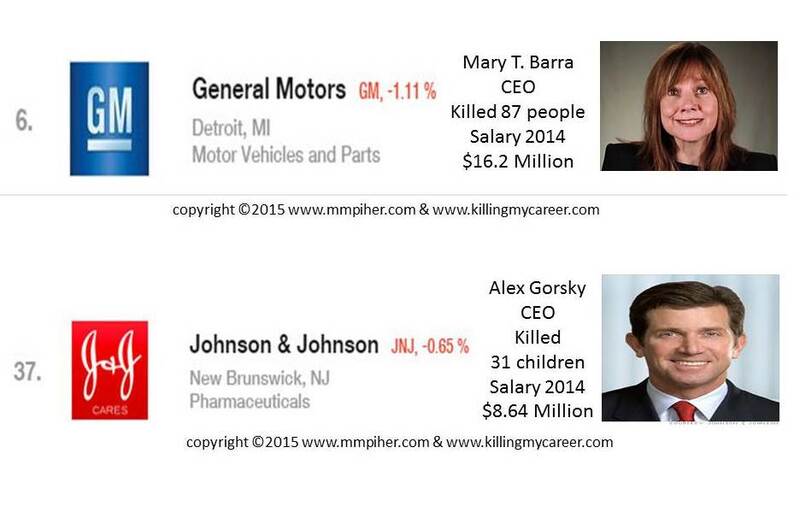 Darn the luck-if only Mary Barra had killed 100 people she may have sailed to the second spot on the list. Better luck next year Mary! Oh and boycott GM until Mary Barra is fired-she should be alright though she did make $16.2 million in 2014 (poor Mary!). Alex Gorsky CEO of Johnson & Johnson Worldwide killed 31 children with kickbacks around Risperdal which qualifies him for a impressive CEO kill card in his own right. Tragically he was only compensated $8.64 million–ouch beat by a girl! Don’t worry though the Board at Johnson & Johnson will keep encouraging, replicating & rewarding this unethical & illegal behavior until Gorsky likely crushes Barra’s numbers with Johnson & Johnson Ethicon Gynecare deaths and another 27,000 cases pending in federal court not to mention billions in federal fines and recalls for Johnson & Johnson DePuy Synthes hips and now knees. These aren’t corporate CEOs they’re corporate serial killers. Johnson & Johnson has been the poster child for dividend-paying growth stocks for many years. For the buy-and-hold investor, it is a great company to own because of its long-term outperformance of the S&P 500 benchmark and its compound annual dividend growth. Despite these positives, though, Johnson & Johnson is not impervious to corrective pullbacks, especially in conjunction with the overall market. Based on technical analysis of the chart, more weakness is ahead for Johnson & Johnson before putting in a significant bottom. Overall, Johnson & Johnson JNJ, -0.64% has been one of the underperforming stocks this year, with price down almost 4% since January compared to the S&P 500, which is has gained a modest 2.7%. For investors who have owned Johnson & Johnson as a long-term hold in their portfolio for many years, periods of underperformance are expected and it should not be a reason alone to sell. 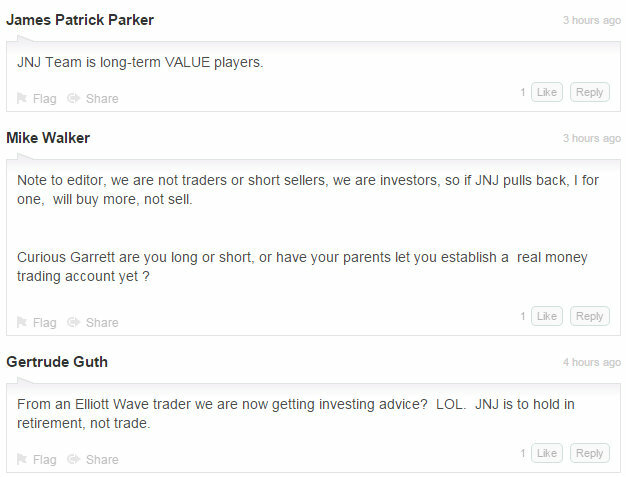 However, for anyone looking for value plays to enter in the near future, they will likely be better served waiting until early 2016 before jumping into this stock. 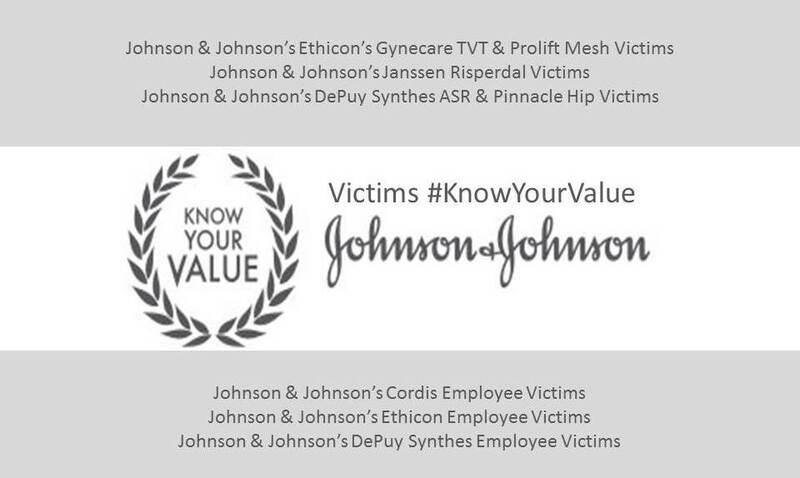 Hell hath no fury like Johnson & Johnson investors challenged on their ideals while not recognizing the rights of others without shame, remorse, guilt or accountability to the many victims they insult & demean in the name of profit as they continued to insult & demean the writer, Garrett Pattern, who exposed the negative truth they’d rather remain hidden. Johnson & Johnson shareholders like Mike Walker remind of another time in history where general spectators (accomplices) in the Roman Coliseum, tried desperately to appropriate emperor status, having failed recognized that just sitting in the crowd betting as accomplices to the emperor’s unethical & illegal behavior didn’t make them regal it made them inevitable victims as they too were eventually fed to the lions. Mr. Walker is defending Johnson & Johnson a company that’s made victims out of patients, consumers, employees & taxpayers and those that read this site won’t be shocked when investors too are fed to the lions for the entertainment of a few. OMG. Straight to the point. We are all Romans waiting to be fed to the lions by #AlexGorsky and #MaryBarra. Killed in cars and in hospitals hundreds of thousands of people a year are victims of these Sociopaths. God help us!